Demand is heating up! Experience the gentle, therapeutic warmth of a Rostra ComfortHeat automotive carbon fiber seat heating system with dual-zone heating for soothing lower back pain and adding car seat comfort that works with cloth or leather vehicle seats. The therapeutic seat heater is fast-heating providing warmth in less than a minute. Treat yourself to the ultimate in comfort by installing both the ComfortSeat Lumbar Support and therapeutic ComfortHeat heated seats in your vehicle today! 3-position control switch (High/Low/Off) *. 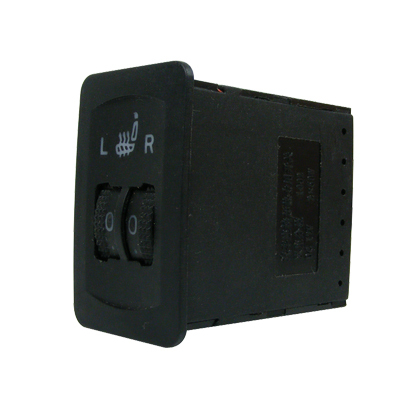 5-position thumb dial control switch with dimable LED **. Heating pads include carbon-fiber mesh weave. Heating pads can be trimmed to fit various seats. Strain relief built into heating pad harness. Wire harness includes protective convoluted tubing. Separate temperature sensors for seat's bottom and back. Locking harness ends for secure connections. Hi-temp adhesive secures heating pads to seat foam. 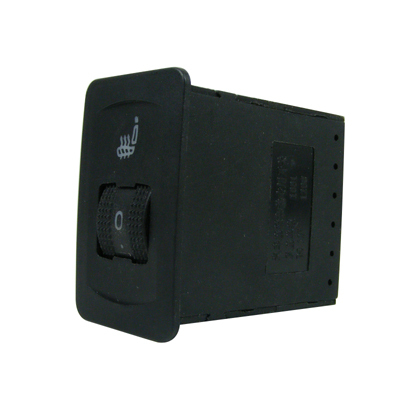 5-terminal relay included for stable power supply. * specific to 250-1870 and 250-1897 seat heater systems only. ** specific to 250-1871 and 250-1872 seat heater systems only. Q: What are the dimensions of the control switches included with each of Rostra's ComfortHeat systems? A: ComfortHeat systems 250-1870 and 250-1897 require a round 13/16" hole to be drilled for control switch placement. 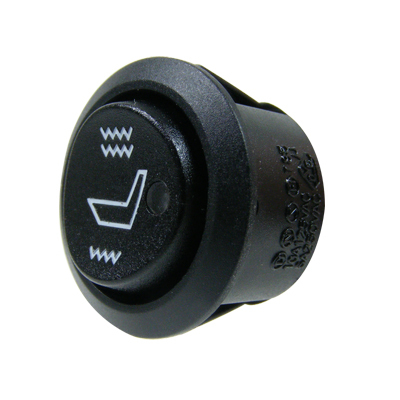 Seat heating systems 250-1871 and 250-1872 require a 2" x 1" rectangular hole to accommodate the control switch. Q: What are the dimensions of the heating pads included with each of Rostra's ComfortHeat systems? A: ComfortHeat systems 250-1870, 250-1871, and 250-1872 include 19" x 10.5" heating pads. Toyota Camry seat heater 250-1897 includes heating pads pre-trimmed specifically for the Camry's seat construction. Q: What temperatures can I expect from the heating pads supplied with my ComfortHeat seat heating pads? A: The heating pad temperature experienced by drivers and passengers alike depends largely upon the exterior seat covering currently installed on a vehicle. In general, Rostra's ComfortHeat pads heat up to 91-degrees Fahrenheit when the switch is in the Low position, and 127-degrees Fahrenheit when the control switch is in the High position. Q: What if the ComfortHeat heating pad is too big for my seat? A: Because we use a carbon-fiber weave for the heating pad's construction, each ComfortHeat heating pad can be trimmed to match the dimensions of almost all seats. Q: Are there any special precautions when trimming a ComfortHeat heating pad? A: When trimming a ComfortHeat heating pad, installers are advised not to remove more than 1/3 of the pad's overall length as overheating can occur if the pad is trimmed too small. Once a heating pad is trimmed, installers must use the included cloth tape to cover any exposed carbon-fiber. Q: Can I trim a ComfortHeat seat heating pad vertically? A: ComfortHeat seat heating pads cannot be trimmed vertically as this causes "dead" spots in the pad and can cause overheating. Instead, installers are advised to cut out small windows in the pad to reconnect the seat fabric to the foam underneath. Q: Can I combine a ComfortHeat seat heater with a ComfortSeat lumbar support system? A: Yes! Seat heaters are the perfect addition to a pneumatic lumbar support from Rostra, but a rear-mount lumbar bladder system, part number 250-1453, is required. Q: Can I combine a ComfortHeat seat heater with leather seat cover upgrade? A: Yes! Seat heaters are a great addition to a leather upgrade - especially on cold mornings or during long road trips. Please note that with the added thickness of leather seat covers, the expected temperature of the heating elements is slightly reduced as the heat must travel through a thicker material. 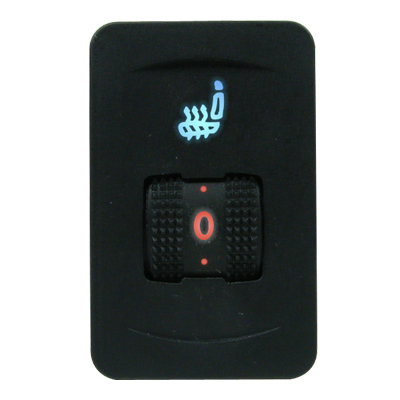 Q: I need to replace the control switch that came with my ComfortHeat seat heating system. What part numbers do I need? Q: My seat's exterior covering is bonded to the interior foam with an adhesive. Can I still add one of Rostra's ComfortHeat systems? A: Adding a ComfortHeat system on vehicles that use an adhesive bonding material is not recommended as the covering will no longer have a material to adhere to within the seat once heating pads are installed. Q: Can't I just use a spray-in fabric adhesive to attach my exterior seat covering to the ComfortHeat heating pad? A: Spray-in adhesives available at most auto parts stores are highly flammable and are not rated to resist the heat output from a ComfortHeat heating pad. As such, they represent a fire hazard and are not recommended for use with Rostra's heating pads. Q: I'm unsure of trimming the ComfortHeat heating pad? Can I just fold it over onto itself to make it fit within the seat? A: Folding the ComfortHeat heating pad onto itself is not recommended as it can result in build-up of excessive heat within the seat. Please view this video on our YouTube Channel for clear instructions on trimming a seat heating pad. Q: Can a ComfortHeat seat heating system be used in a vehicle that is operated or transporting an individual with reduced sensitivity to hot and/or cold temperatures? A: ComfortHeat systems are not recommended for use in seats transporting persons with reduced temperature sensitivity. This includes individuals with partial or full loss of senstivity including paraplegics, children, and the elderly. Q: My passenger seat includes an occupancy detection sensor to automatically arm the airbag system when I am driving with a passenger. Are there any concerns with this functionality operating when adding Rostra's ComfortHeat systems? 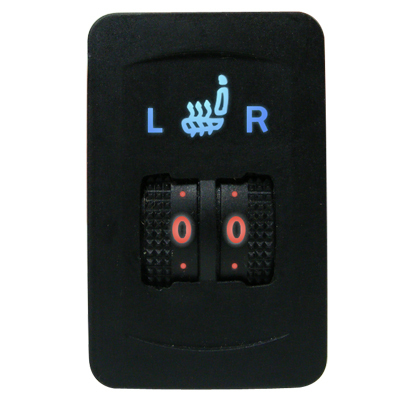 A: Rostra's seat heating systems are designed to operate with two heat elements connected at all times. Because the heat generated by a seat heating element can interfere with the operation of occupancy sensors, we do not currently recommend installing a seat heating kit onto a seat with these types of sensors.